This beautiful angel artwork, was created by Mystical Artist and Angel Communicator, Lori Daniel Falk, to capture the magic of Sedona’s vortex energies, along with the healing power of the angels, creating a piece of angel art that is at once breathtakingly beautiful and energetically powerful. The Sedona Magic Angel is infused with the magic of Sedona’s spiritual vortex energies along with the emotional healing power and strength of the Golden Light Angels; injecting just what is needed to move YOU at a heart level, through your emotional system, to bring forth that which you are so wanting of. The colors, the symbols, the energy coming through Lori’s hands, all gets embedded into the page, creating a piece of angel art that serves then as a powerful manifestation tool, meditation vehicle and spiritual connector. 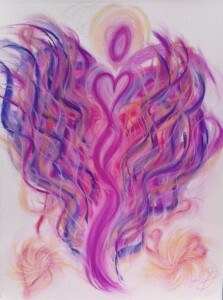 Invite this Sedona Magic Angel Art into your home and watch your channeling abilities intensify. This beautiful angelic artwork, was created by Visionary Artist and Angel Communicator, Lori Daniel Falk, to infuse you with the magical energy of Sedona’s amazing vortex energy.